Conifer Bailey Forums 285 Bound • View topic - Cat vs. Bear Cat wins. Cat vs. Bear Cat wins. Post subject: Cat vs. Bear Cat wins. Post subject: Re: Cat vs. Bear Cat wins. Funny! Doubt it would be the same w/o door/glass. 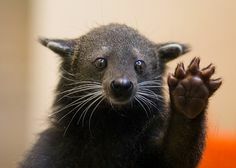 I was hoping to see what a Bear Cat looks like.